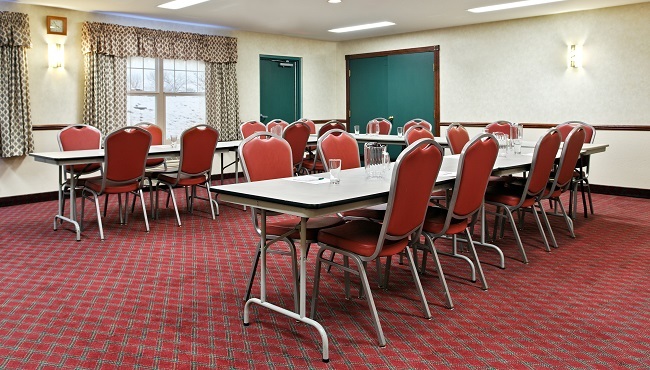 Spanning 780 square feet, the meeting room at the Country Inn & Suites in Dubuque provides an ideal venue for gatherings of up to 25 people. The function facilities offer free Wi-Fi and easy access to power sources, data ports and phone lines. Event organizers can also request equipment like a flip chart, a podium, a portable screen, and a TV with DVD player. Please note: These amenities are provided for business meetings only; charges may apply. The Country Inn & Suites, Dubuque provides spacious and welcoming rooms and suites for wedding parties, traveling sports teams and tour groups. Reserve a block of rooms by calling the hotel at +1 (563) 583-2500.